Two Bears Farm and the Three Cubs: So What If I'm a Crazy Cat Lady? I have a couple, but the bed is off limits. I already have 2 dogs in there. Mine come in for food and cold. I like cats, they seem to like me and I never had one bark at me so that is good. 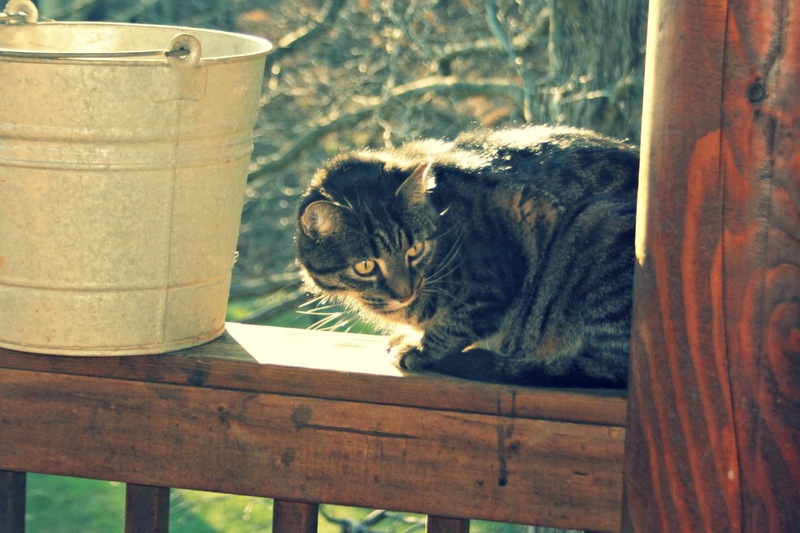 I like the photo of the kitty beside the bucket, that might make a good painting. Aww, I am glad you manage to have your kitties and love them despite your allergy to them. Very sweet, pets are more than pets, they are real additions to the family! What is it with mice and minivans?? Us too! We are also cat people, and of course all except our daughter are allergic! Happy day after Thanksgiving! Now you know that I love, love, love this post! :-) People probably think I'm a crazy cat lady, too, but I don't care. Chase Bird sleeps beside me for much of the night. He helps me sleep better, I think. Larry and I are both allergic to cats. I didn't know I was until I got Waddles. My allergist told me I would have to find her another home, and I told her very firmly that that was not going to happen. We've built up tolerance, too. We're already allergic to so many other things, cats don't make it worse. So, you're keeping a cat house! Hmmmm. Well, along as the neighbours don't mind, I guess that's OK.
We have never had cats because my wife is allergic to them. Really allergic! So we have had dogs. Oh I'm with you on being a crazy cat lady. We have 3 indoors and 2 outdoors, with another cat that comes around just for food lately. I've always been a cat person. I always thought it would be the worst thing in the world if I were allergic, but it's good to hear you can build up a tolerance! I remember all the mice you used to get in the van. I am so glad that problem has been taken care of by your furry friends! We usually get one mouse a winter. We didn't last year and I was oh so glad. But one of the winters when we did, the mouse was in hubby's car,e eeeeeeeeeek. Better him than me because I'm scared my reaction would have been bad. They freak me out for some reason. I am a cat lady too- yours are sweet! Cute photo! You're not a crazy cat lady, but maybe a little bit too brave! If I were allergic to cats, I would not adopt one. Cute cat. So lovely. I love cats. I have three kitten. They are so lovely. I adopted them from my sister house. Everyday, there are so many cats come to my house. Mouse hunting. I like cats and I don't. My husband hates cats and so do my dogs! lol I had a few cats when I was a teen. A neighbor gave us a male cat that turned out to be a female cat that got pregnant and thus we had lots of kittens! That's a hoot. We have 4 cats, 3 sleep on the king-sized bed. No play fighting involved. The 4th, hubby's cat, won't tolerate the others. Which is just as well as she doesn't like me, either! I have one inside the house cat, Midori. She is a Himalayan. She likes to play with the ferrets. We have one cat in the enclosed part of the barn (Itty Bitty Kitty), and I have 14 barn cats by last count. They eat a 16 pound bag of Meow Mix every three days. Cats are good, comforting animals. I like cats, but man I'm really allergic to them. I basically seem like a zombie when I'm around them. I just walk around all out of it. One of our daughters is allergic to cats but has three in the house and 3-5 outside. She takes care of them all and had them all fixed so there would be no cat explosions. It was expensive and took time but the job is done and everyone seems to get along. HOW did I miss this??? It is Sunday now and the only reason I saw it is because I was checking you for a very rare weekend post. I am very allergic, too! But the new allergy medicines work wonders. I take three. Months ago I did a stupid thing, I snuggled with Sunny and put my nose in his fur! I still have boils and sores in my nose! After all this time. I have been using cat ointment on it!!! Yes, the vet told me it would be just as good as people medicine! I remember when you had all those mice!! I know your feeling about cats. I am always finding another stray to give a home. I can't imagine not having a kitty around---although I could understand the allergies. My cats still avoid the kids...even though they are grown and have always been nice to them. Isn't that weird? What a cute and funny post! You and your cats. Hey, I have three orange ones that would love to live with you. :) HA HA! I'm glad you don't have any mice issues….cause that is a huge issue for me too! I love cats too but we no longer have indoor ones, we just take care of the outside strays. One might do for an inside cat but she even wants out of the garage in the morning (after her "treats" of course). I really think you can build up a tolerance to some cats more than others, too.